1. Italeri have released their 1:72 US Army SOA Chinook. This kit, #1218, is of course based on the existing Italeri Chinook kit #064, and contains all the same parts, except that the original cockpit glazing is replaced by the more pointed radome-nose that first appeared in 1996 in the limited-issue Italeri #045. The clear parts are enclosed in a separate plasic bag, a welcome innovation for Italeri. 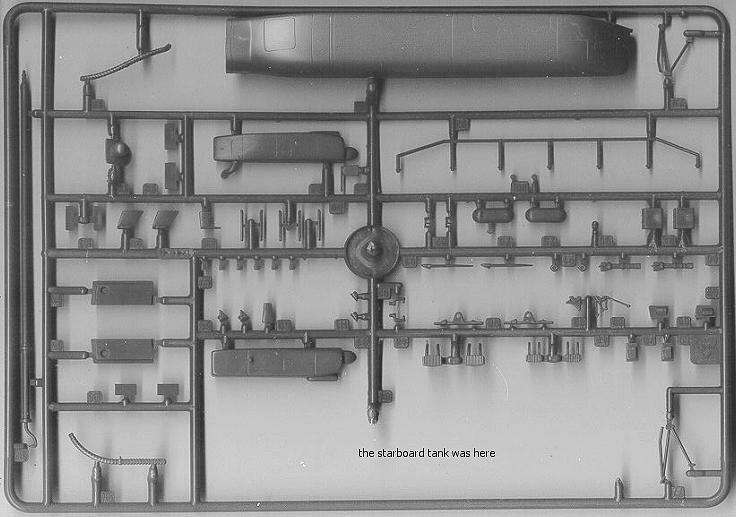 The 67 new parts required to convert the regular Chinook into an MH-47E are on an additional sprue, including the distinctive long-range fuel tanks, numerous warning receivers, aerials, antennae and counter-measures devices, pitot tubes, new front wheel mounting points (moving them further forward), winch, pod-mounted radar, refueling probe, and a pair of GE 7.62mm M134 miniguns with external shell-casing chutes. Rather than making new fuselage moulds, Italeri have decided that it will be the modeller's task to cut the existing tanks from the fuselage halves and replace them with the new ones. I am sure they had reasons for taking this approach, but these remain a mystery to the rational world. To make life a little easier they have added a deep groove on the inside of each fuselage half, leaving only a thin skin of styrene that can easily be scored through with a sharp, pointed blade. An area of the right fuselage around the rear window also has to be removed, to be replaced by the large rectangular window of the MH-47E. The rotor blades still have the square cut-off at the root that was correct for the 47A to 47C Chinooks, but was replaced by an angled cut-off on the 47D and the MH-47E. These will need to be modified. The instrument panel is also the original analogue version. The markings for this aircraft are unsuprisingly minimal; a selection of grey walk-way areas, a few yellow 'step' stripes, and the 'United States Army' titles. There is a small serial '475' to be applied to the cockpit behind the pilot's side window, making this aircraft 92-0475. 2. 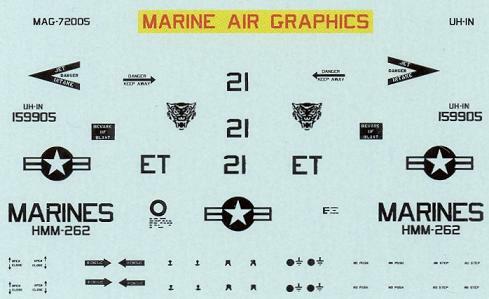 Here's an update on the range of 1:72 decals available from Marine Air Graphics (see HKN #133). MAG72001, USMC UH-34D SAR, MCAS Kaneohe, Hawaii 1969. MAG72002, USCG HUS-1G (UH-34), this includes numbers to do any of the six USCG aircraft. MAG72003, USMC HRS-2 (H-19), HMR-361, MCAS Santa Anna, Ca, 1952. This is the all blue scheme with white lettering. MAG72004, USMC HRS-1 (H-19) SAR, MCAS Kaneohe, Hawaii. Overall orange scheme. MAG72005, USMC UH-1N, HMM-262 Composite, MCAS Kaneohe, Hawaii 1982. Low-vis green with black lettering. MAG72006, USMC AH-1J, HMM-262 Composite, MCAS Kaneohe, Hawaii 1882. Low-vis green with black lettering. MAG72007, USMC CH-46, HMM-262 Composite, MCAS Kaneohe, Hawaii 1982. Low-vis green with black lettering. MAG72008, USCG HOS4-2G (H-19). Overall chrome yellow scheme. MAG72009, USMC UH-34D, HMM-262, Project Mercury, 2 different aircraft. Note that any of these can be printed in other scales such as 1:48 on request. Contact Gary Dobias for prices and payment details. Note also that MAG are always willing to accept custom orders and suggestions for new decals. If you send photos or research material, you will of course be rewarded for any decals produced as a result. 3. Trumpeter have their own website; unfortunately there doesn't seem to be anything there at the moment about future releases, though I did spot an Mi-24 Hind in the title graphics. 4. 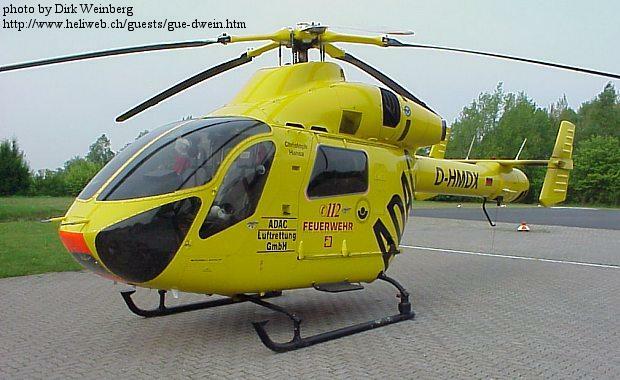 The 1:72 Czech Master resin kit of the MD900 Explorer has been re-boxed by Classic Planes/Modellbaustudio Rhein Ruhr, who have included a sheet of decals believed to be for the German ADAC aircraft D-HMDX 'Christoph Hansa'. This kit is available from Luchtvaart. 5. Roden have released their 1:72 version of the PKZ-2 Austro-Hungarian tethered observation 'helicopter'. There's a comprehensive description and pictures of the kit at their website. Thanks to Gary Dobias (Marine Air Graphics), Martti Kuivalainen, Dave Fleming, & Erwin Stam (Luchtvaart).